Life gives us plenty reasons to enjoy, every now and then an event comes and we forget the past pains and move on with great spirits as if nothing has ever happened. That’s the beauty of living with no regrets. Every celebration should be enjoyed with great euphoria, this life is too short and if it is wasted in caring too much about agonies and turmoil, we won’t be able to live happily, it would only be existence. Create the moments within moments and spread glee among your circle. Do not lean on others that they would come to make you happy, make your own day as well as of others and never miss a chance of bringing people together. A graphic designer is faced with many challenges during his working hours, he is to think deeply to carry out each of his creation, and his mind should be active enough to grab the ideas from the head, manipulate them and implement them as being thought of. 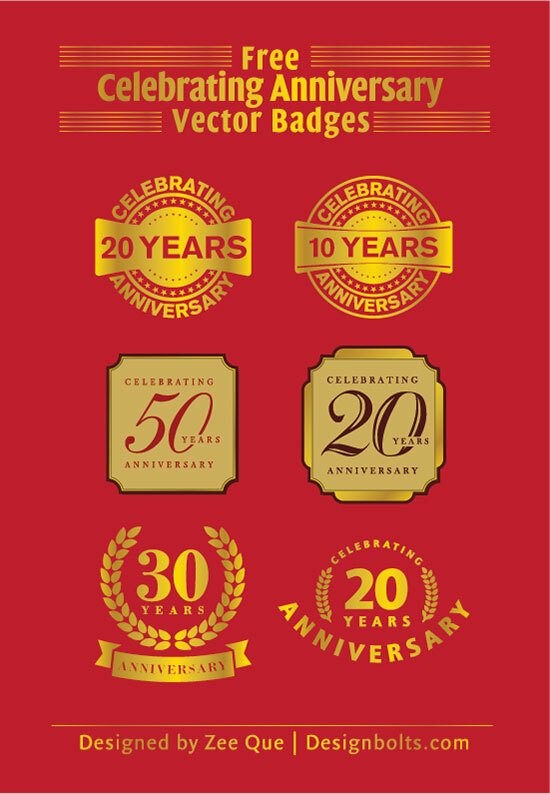 If a graphic designer is up to designing a company’s brochure celebrating its anniversary my today’s post of free celebrating 20 years anniversary Vector Badges (Ai & eps) would be a great resource for you. Designing a brochure, flyer or any poster of a company/organization, some key elements should not be overlooked and that are to add up the elegance and spark. There should always be a “plus point” in the respective design. You can put up these badges in to your designs, these badges will beautify your projects, if you want cooler results then go for golden foil printing of these badges to enhance the design’s entire look and appeal. Implement any of these badges aptly to add up value and worth of your respective design. Scroll down to get the glimpse.